We kind of feel bad sharing this because we know that Toni’s Tuscan Table is a little gem that not everyone has discovered yet . . . so, we know people will be pissed at us for blowing up their spot, but we’ve got some great news to share. Yup, Toni’s Tuscan Table has moved and reopened at 1006 Broad Street in Bridgeport. Admit it, you clicked on this just because we said “free food.” Well, good, we got ya! 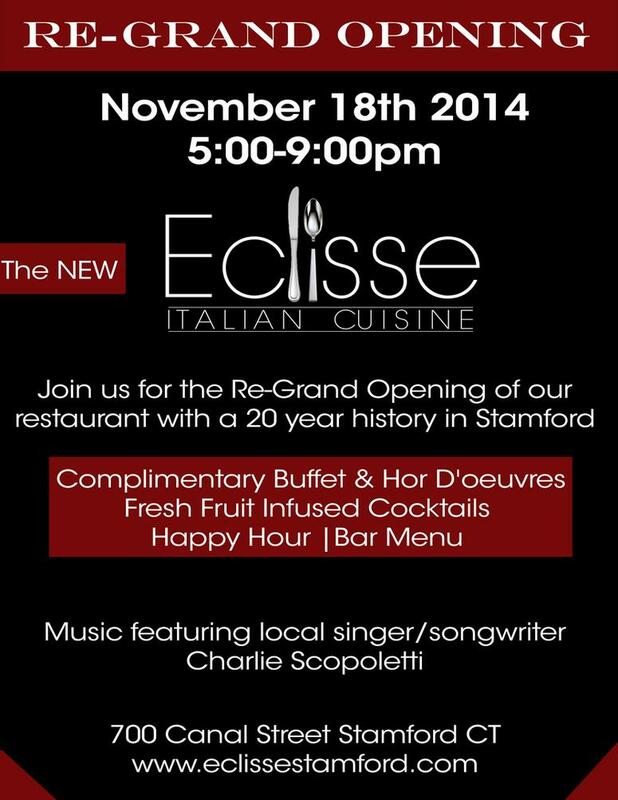 Now that you’re here we need to tell you about Eclisse in Stamford. They’ve been around for 20 years and have been one of the main-stays on Canal Street when there wasn’t much else there (now there’s Fairway, Dinosaur, Harlan Social, and more). About a year ago, they changed things up and introduced the Tango Grill, mixing in Argentinian food with Italian. While there were some favorable reviews of this Italian/Argentinian duo, it seems that people online were most happy with their straight forward, classic touches on Italian food. Everybody knows this is how you make the perfect margarita…right? Look, there’s a mix or artificial flavor packet for almost any drink you could imagine! But that doesn’t make it great…or even drinkable. What makes a cocktail good is finesse, detail, attention, and help from a moustached hipster. Plate of bbq, snacks, and fixins at at BarQ B.B.Q. When we talked with Bob LeRose about the opening of Bar Q in Stamford to say we were excited would be an understatement. Small plates of BBQ with great drink options? It seemed like a no-brainer! Now, having been there five times, we can say the food has definitely improved and they’ve worked through their opening kinks. But, it’s crazy to think that they have been open for a year already! And, with that year of being open, they’ve changed things up a bit. First off, they’ve revamped their menu by adding some larger BBQ plates, salads, sandwiches, and other options that will get you excited like the Bar Q Cuban sandwich. They have also added in good options for family dining such as the Sunday evening $50 family style dinner that gets you 3 fixins’, 5 BBQ items, and 3 sides. And, you also might have heard about their new concept on Thursday, Friday, and Saturday nights starting at 10: Bar Q Saloon. Cowgirls dance on the bar and serve up some mighty fine drink specials. They play country music and, at times, they even have a mechanical bull for your to conquer out on their patio. You’ll need to follow them on FB to see when the bull has arrived. Fairfield Cheese Company Celebrates 3 Years w/ Free Cheese Tasting + Burgers! If you remember that commercial, you probably feel really old and wonder why you even liked it to begin with. If you’ve never seen that commercial, you probably wonder how we came to love cheese when there were commercials like that. Despite that inglorious ad, spouting the virtues of a world with cheese, the melty and stringy stuff has become near and dear to our hearts. One of the reasons why people in Fairfield County have fallen for cheese is three years of the Fairfield Cheese Company. They have been selling artisanal, hand-crafted, cheese as well as farmstead cheese to their customers. In addition, they have lots of options for meats to pair with the cheese and have lots of other great food choices. So, they are turning three years old and decided that it’s about time to break out monster and massive amounts of cheese. Stop by their store on Saturday, 5/19/12 from 1-4 pm for some eating fun. You can meet Laura Downey and Chris Palumbo (owners), their mascot Meg the Cow, nibble on and rave about a cheese tasting, and om nom nom on meaty grass-fed cheeseburger sliders provided by the awesome Saugatuck Craft Butchery. When you’re there, check out the over 100 different cheeses avaialable…oh, and they add to that quite often. The owners make it a point to mention that they have an emphasis on American artisan cheese. That’s something that we can get behind. Also, on another fun note, they’ll be competing in the Third Annual Cheesemonger Invitational (did you know this existed?) in NY on 6/23/12. Let’s cheer them on while we waft the odor of cheese to our noses, gently taste the cheese, see how the wine or beer highlights the flavor…oh, who are we kidding? Let’s cheer them on and chow down on big hunks ‘o cheese.